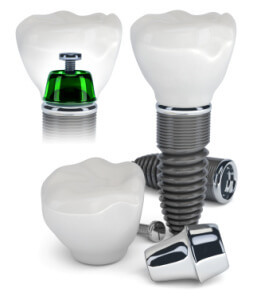 Home / Are Dental Implants Painful? Dental implants are considered to be the best option for tooth replacement, especially for large scale tooth replacement. The procedure will involve some drilling into the jawline and in insertion of surgical implants. The entire process can be completed in a few hours, though recovery time takes a few weeks. Some patients are concerned about the amount of pain they may experience while they are undergoing the procedure and in the weeks following as their body heals from the surgery. But are dental implants painful? Here we look at the procedure and the sort of pain that you can during and after dental implant surgery. During surgery, the specialist will administer a local anaesthetic. Patients may be placed partially or fully under during the procedure. This means no pain should be felt, in most cases. Even as the doctor drills holes for the implant into the bone of the jawline, the patient should only feel mild discomfort caused by the vibrations and no pain whatsoever. In some of the more complicate procedures, where grafts or other complex apparatus is required, there may be some minor pain. These will require longer procedures, were the patient will need to be on the operating table for longer. After the holes have been drilled, then the surgical implants will be inserted. Attached to them will be the replacement teeth. The procedure should suffer no complications, as it is not a difficult one for most specialist. The rate of success for this type of procedure is incredibly high. The healing process following surgery should take anywhere from six to eight weeks. During this time, the patient may suffer from bruising, swelling, oozing or leaking blood. None of these should cause the patient much if any pain, though the doctor will prescribe a pain medication, just in case. Now there may be some pain if the patient tries to eat crunchy, tough or very hard foods. This can cause the implants to fail, shift or become dislodged, which can be very painful and require additional surgery. Patients are advised to only eat soft foods while they recover to allow the implants time to settle in and take hold. For the most part, patients experience little to no pain. Pain medication will be prescribed, but most patient rarely need it. So long as they take care of their gums, teeth and dental implants, they should have no problems. If you are concerned about the level of pain involved in this procedure, then you really should not be. It should be relatively painless and it can be very beneficial to you. A successful dental implant surgery can give you new, healthy teeth that not only look natural but also work effectively. You should be able to speak, chew and use your mouth normally, and there should be few noticeable differences between your old teeth and the new ones once your mouth has healed completely. If you have any other concerns about the surgery, please consult with the specialist who will be performing it for you.